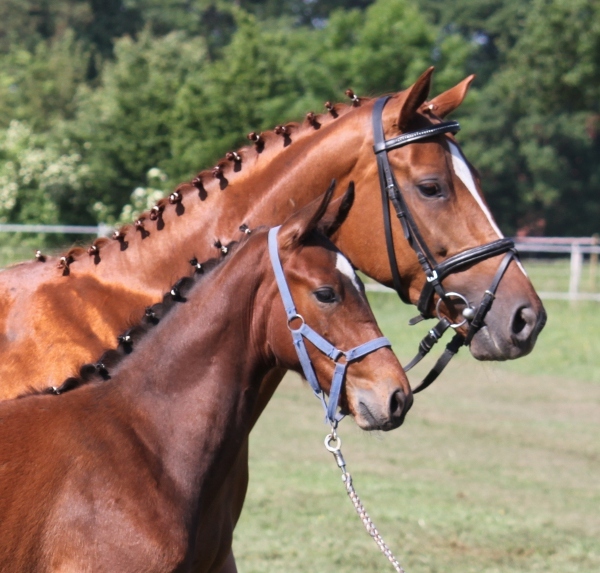 Our goal is to produce Hanoverian and Oldenburg warmblood horses of exceptional quality – ones that are considered outstanding not just here in the US but also in Germany. 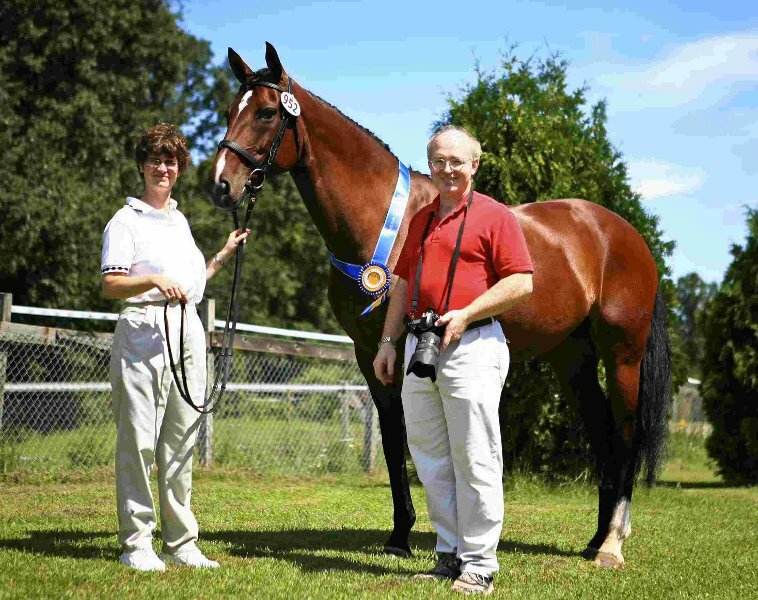 We primarily breed for dressage horses with excellent gaits and temperaments. However, we also produce horses that can succeed as hunters, jumpers, and eventers. We can do this because in addition to having excellent gaits, our broodmares are outstanding jumpers, have “blood” in their pedigrees, and we cross them with dressage stallions that also have jumping abilities. We can breed exceptional horses because we have exceptional broodmares that include an Oldenburg Rastede participant, a Hanoverian German mare show winner, and a US mare performance tour winner. In addition, our mares come from proven, highly successful mare lines that have produced a number of famous stallions. To the best of our knowledge such mares are rare in the US. St. Pr. Prime Time delivered yet another incredible foal. As suggested by her name, this filly is “Poetry-in-Motion.” Check out this video of her at 3 weeks old. We are retaining this filly but her full brother by Damsey is for sale (located in Germany). El. St. Pandora (owned by Christine Arns-Krogmann who also owns Weihegold) who comes from the same grand dam as our Prime Time (Primera AA) had a foal that placed 4th in the Lienen foal championship and her 2014 colt was licensed stallion. We are very grateful to own a mare from this same exceptional damline. Davina and South Ridge Bliss, like our previously sold horses, have found wonderful new homes. We are proud of placing all of our horses in the best of homes (we check references) and even more pleased that all of them have been highly prized by their owners and trainers! South Ridge Bliss is now the dam of not one, but two, fillies that have participated in the USEF National Young Horse Championships. Don Amour continues to be featured on Don Frederic's stallion video promotion. St. Pr. Prime Time had another outstanding colt, this time by Damsey FRH who received 9's for his Piaffe this year! Don Amour is featured on Don Frederic's stallion video promotion as an example of an outstanding foal! Belinda, St. Pr. Farina's 2010 filly, was sold and imported from Germany to Canada. In Germany, St. Pr. Farina’s first foals Benito and Belinda are competing successfully against professionals with their amateur riders. We were blessed with two gorgeous fillies, which we will retain as future broodmares. One by the proven producer Dacaprio, another by the young stallion Grey Flanell. We are proud to have chosen Grey Flanell who subsequently won the PAVO cup and was selected “Hauptpraemiensieger” by the Oldenburg Verband based on his incredible first foal crop. 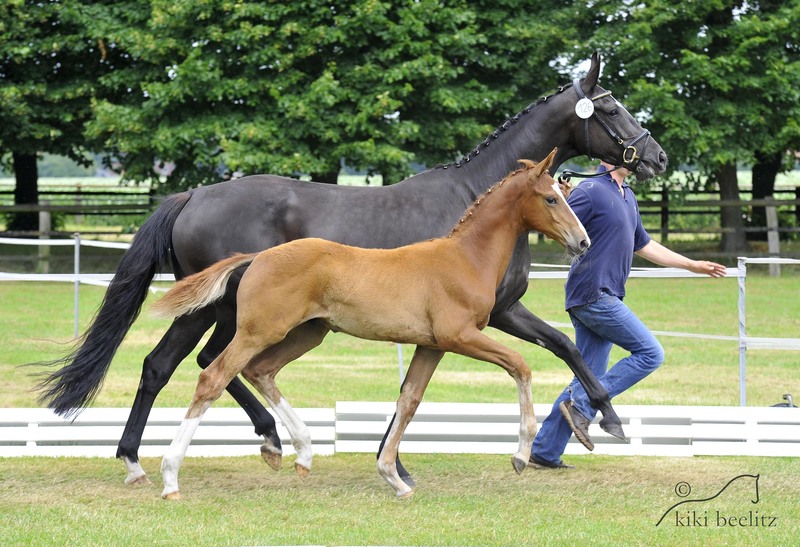 Many of his foals sold for high prices at auction, with top prices ranging from 32,000-70,000 Euro! Don Amour, Prime Time’s first foal, receives “premium” title, is top foal of 12 Don Frederic offspring at competitive Muehlen (Germany) inspection, featured in Schockemoehle video of impressions, selected for prestigious A.O.S. 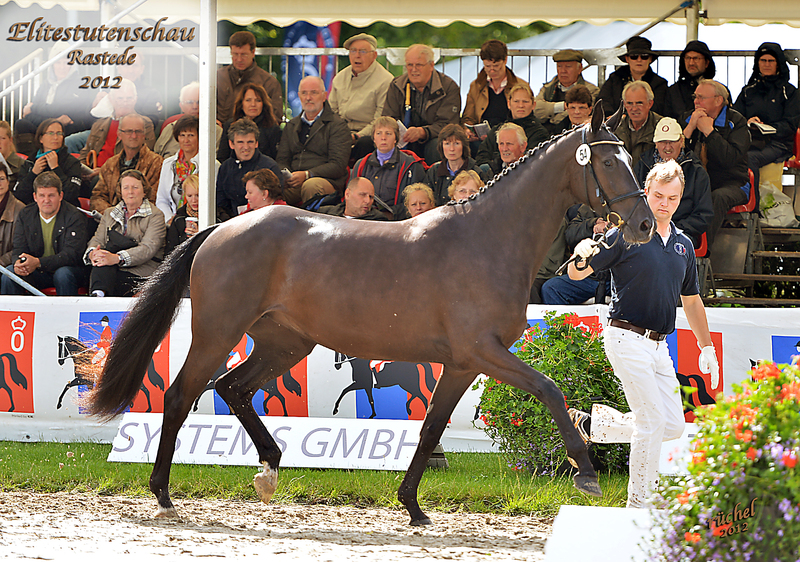 Auction, and sold to Hengststation Beckmann, a successful German stallion station as a stallion prospect. Belinda, Farina’s 2010 filly, receives St. Pr. 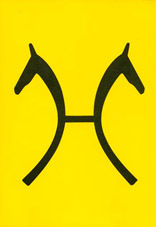 A. title at the 2013 Goettingen (Germany) mare show. South Ridge Bliss, after seven years as a broodmare, and in second show of her life, wins numerous 1st place ribbons in hunter/jumper classes with her 10 year old rider, resulting in two high point scores. Prime Time obtains her inspection and mare performance test scores (mostly 8.5 and 8s) which earn her participation in the highly selective 2012 Oldenburg Rastede (Germany) mare show. Purchased Prime Time as a two year old, her Elite dam produced two premium approved stallions. Purchased South Ridge Bliss with highly successful show and jumper pony pedigree and dam of “Fancy This,” one of the top 15 five year olds competing in the 2010 USEF National Young Horse Championships. Purchased St. Pr. Farina – mare show winner with high inspection and mare performance test scores (8 overall) and out of highly successful damline that has produced stallions like Benetton Dream, Danone I, Der Designer and Winterprinz. Started D&M Warmbloods in response to First Class’ success. First Class was highest scoring mare on US Hanoverian Mare Performance Test Tour (overall score of 8.5 and combined score of 9.5 on free jumping)! She received both the Engler-Friedlaender Memorial and Benchmark Perpetual Trophies, making her one of only two mares to have received both in a single year. Feel free to contact or visit us. We look forward to meeting you! You can also follow us on Facebook: DM-Warmbloods. Pictures of Don Amour with his dam St.Pr. Prime Time. St.Pr. Prime Time at Rastede! 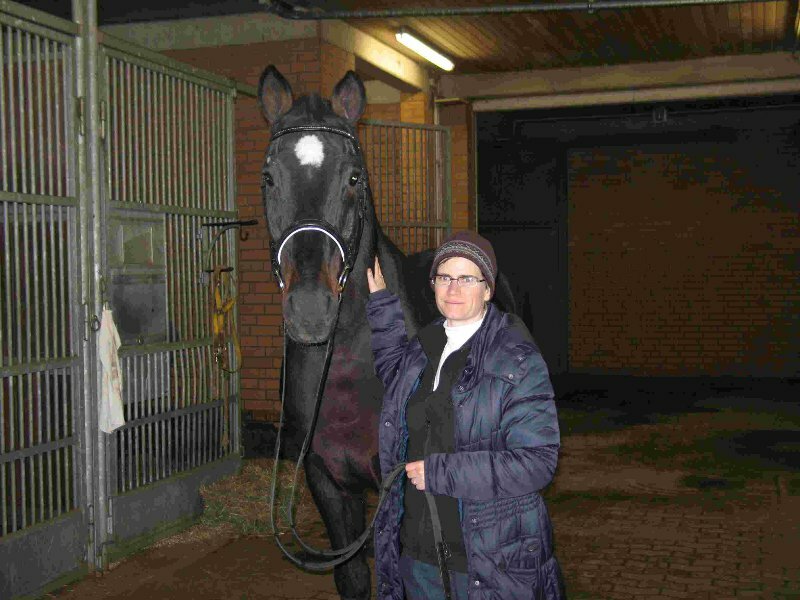 Michaela with Fabriano at Celle (2010).